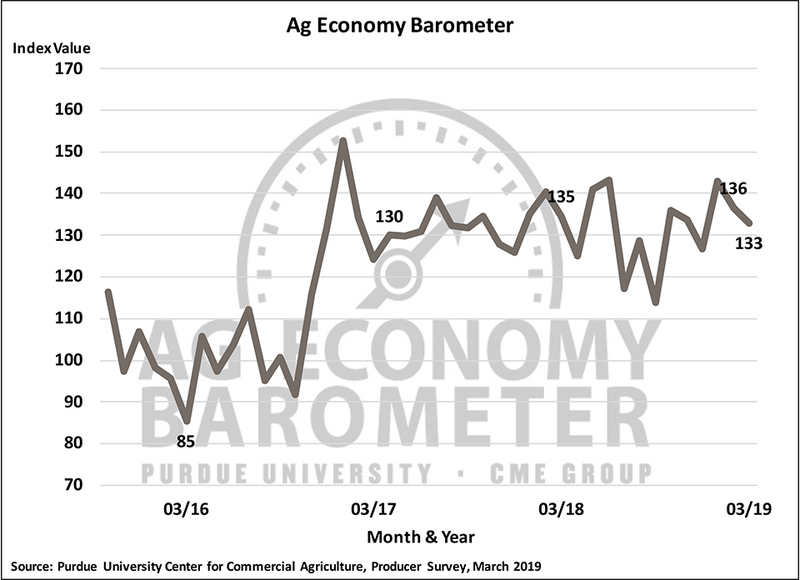 The Ag Economy Barometer drifted lower in March to a reading of 133 down from 136 a month earlier. 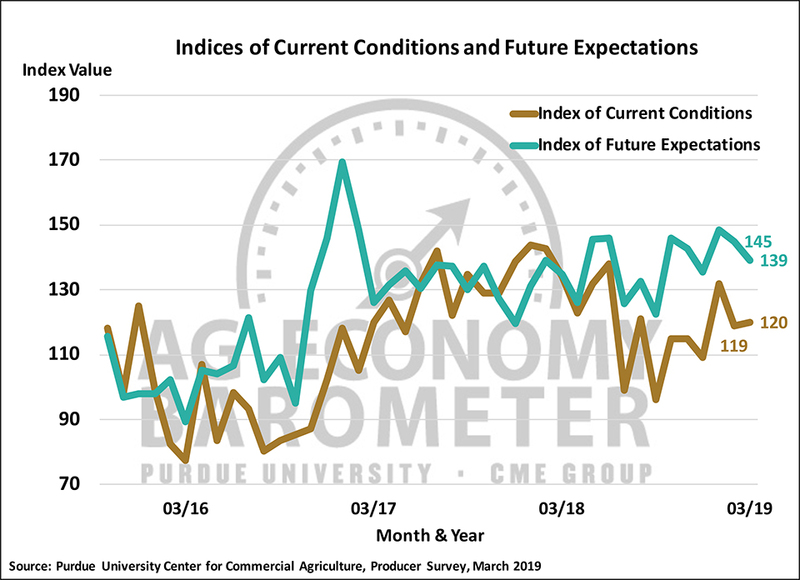 Increasing concerns about future economic conditions drove the barometer lower as the Index of Future Expectations declined to 139 in March compared to an index value of 145 in February. This contrasted with producers’ Index of Current Conditions, which at a reading of 120, was virtually unchanged from February. Although the Future Expectations Index declined in March, it is still 15 points stronger than a year prior. In contrast, the Current Conditions Index is 14 points below its March 2018 value. The Large Farm Investment Index rebounded during March to a reading of 57 compared to a value of just 50 one-month earlier. This month’s value was the second highest reading for the Investment Index since last summer when it was in the low 60s. Although the Investment Index improved, this more optimistic attitude did not carry over into producers’ perspective on farmland values. The percentage of producers expecting farmland values to decline over the next year increased from 20 percent in February to 25 percent in March. Similarly, the percentage of producers expecting lower farmland values 5 years into the future rose to 15 percent up from 11 percent one month earlier. The level of financial stress in the production agriculture sector continues to be of concern, prompting us to pose several questions to producers on this topic. In March, approximately 6 out of 10 (59 percent) of producers said they expect their farm’s 2019 financial performance to be about the same as in 2018 with the remainder of respondents split evenly between “better than” (21 percent) and “worse than” (20 percent). Second, we asked producers whether they are more or less optimistic about their farm’s financial outlook today compared to a year earlier. Just over half (52 percent) of respondents indicated they are less optimistic about their farm’s financial future now than a year earlier. For the second time this year, we asked producers about their farms’ operating debt. Specifically, we asked producers whether or not they expect their operating debt to increase, decrease, or remain about the same in 2019 as in 2018? 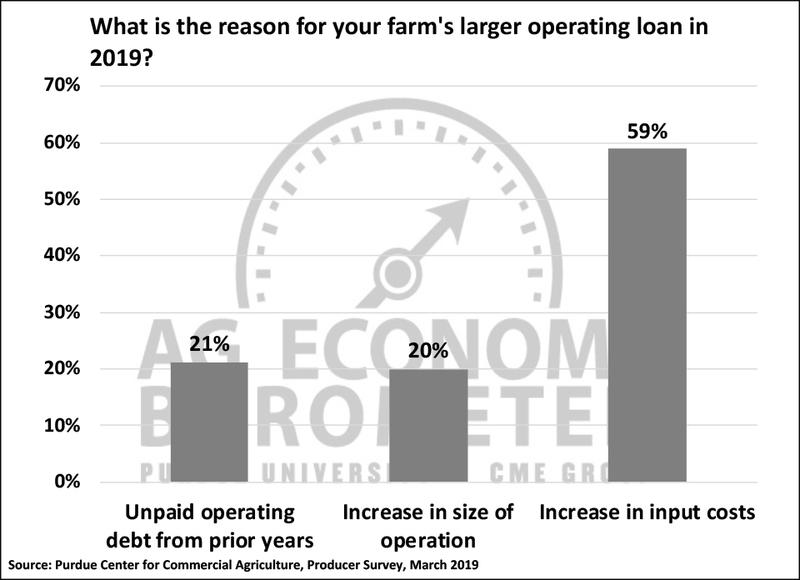 Respondents who indicated they expect their farm’s operating debt to increase received a follow-up question, asking why they expected their operating debt to increase? In March, 22 percent of farms in our survey said they expect to have a larger operating loan in 2019 than in 2018. When we followed up and asked why, 21 percent said it was because they were carrying over unpaid operating debt from a prior year. These results were similar to what we observed when we posed the same questions in January 2019. In January, 25 percent of the farms in our sample indicated that they were going to have a larger operating loan in 2018 than in 2019 and when we followed up and asked why their operating loan would be larger, 27 percent responded that it was because they had to carryover unpaid operating debt from prior years. Combined, these survey results suggest that 5 to about 7 percent of U.S. farms are under some degree of financial stress, using the need to carryover unpaid operating debt as an indicator of financial stress. What’s going to take place with respect to agricultural exports over the next several years continues to provide uncertainty about the agricultural commodity price outlook. 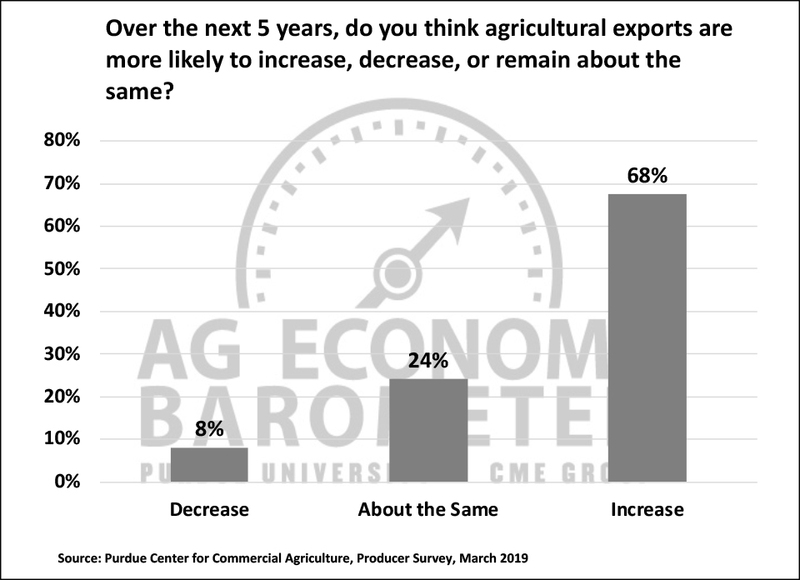 In March, we again asked producers if they expect agricultural exports to increase, decrease or remain the same over the next five years. Just 8 percent of producers expect ag exports to decrease whereas 68 percent said they expect ag exports to increase, which was the most optimistic perspective on ag exports since we first posed this question in May 2017. To gain more clarity regarding what producers think will happen with respect to the trade dispute with China, we posed two questions. First, we asked producers whether they think the trade dispute with China will ultimately be resolved in a way that benefits U.S. agriculture? Producers were confident that the dispute will be resolved satisfactorily as 77 percent responded yes to this question. Then, to learn more about the speed with which producers expect the trade dispute with China to be resolved, we asked survey respondents in March if they think it is likely or unlikely that the soybean trade dispute with China will be settled by July 1? Responses were mixed with over half (55 percent) of producers indicating they think it is unlikely the dispute will be settled by July 1. So, producers are cautiously optimistic about future growth in ag exports, and over three-fourths of producers ultimately expect the U.S. trade dispute with China to be resolved in a way that benefits U.S. agriculture, but less than half of producers expect the trade dispute to be resolved before July 1. Ag producer sentiment weakened slightly in March as agricultural producers expressed less confidence in future economic conditions. Ag producers also expressed more concern about farmland values as one out of four producers in the March survey said they expect farmland values to move lower over the next 12 months. 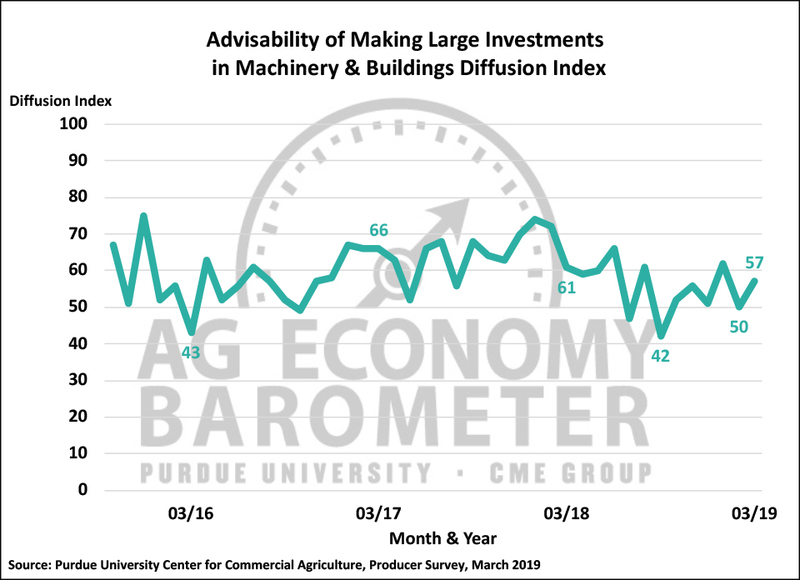 Despite their concerns about future economic conditions, producers in March were more inclined to think this was a good time to make large investments in their farming operations than they were in February as the Large Investment Index rose 7 points compared to a month earlier. Financial stress is evident among some producers. Survey results from January and March 2019 suggest that 5 to as much as 7 percent of U.S. farms are suffering from some financial stress, using the need to carryover unpaid operating debt as an indicator of financial stress. Correspondingly, just over half of farms surveyed said they are less optimistic about their farm’s financial future now than they were a year ago.